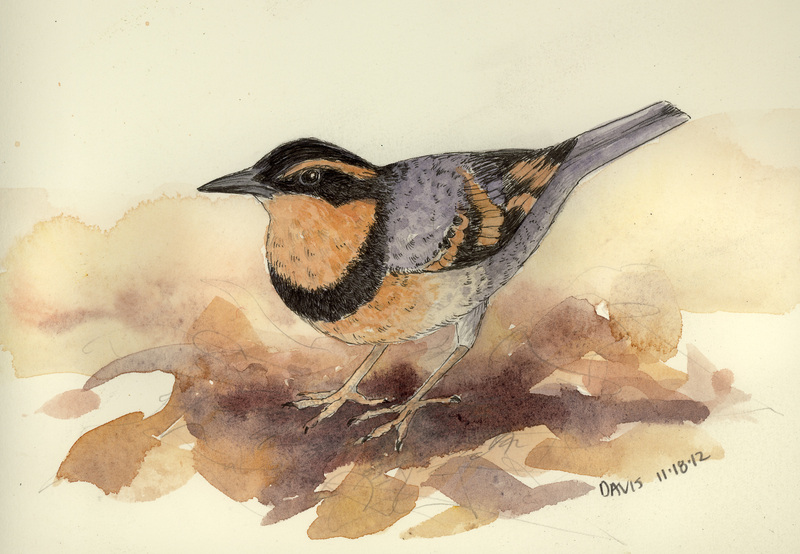 Male varied thrush. Watercolor, ink, and pencil on Arches hot press paper. Started two days ago, finished today. One of these days I want to master the intricacies of drawing bird feet. They come through the garden in the morning, catching my eye with a flash of orange and movement. They’re not exactly furtive, but they are alert and always in motion. Varied thrushes (Ixoreus naevius) are common birds in the coniferous forests of North America. I first became aware of them when I worked in north Idaho. Their buzzy single note whistles echoed in the rain-dripping tree canopy of June. When I hear that song, I think of snow melting in the mountains and high water in the rivers. They can be found in British Columbia and Alaska, south into coastal California, and east to northwestern Montana. I remember camping at the Fish Lake Guard Sation last summer, and hearing the varied thrushes as part of the dawn chorus. Now they have come down to lower elevations. They travel in flocks, the males brighter than the females. It’s strange to see them out of the treetops, but there they are. The robin-sized birds find hiding cover in the Oregon grape and other shrubs at the edge of the driveway. One or two fly down and scratch at the ground like towhees. Seeds and berries make up their diet, but there may be bugs under the leaves as well. I watch them peck, then they’re on the wing again. November is always a difficult month for me. The trail crew stretches fieldwork out as long as possible, but the weather shuts us down. The mountains are closing in for the winter, the daylight hours are shorter, and it’s hard to be productive when the ground is frozen and the trail is hidden under snow. There are things to do at the ranger station–reports to write, plans to make for next year. Tools to be cleaned up and stored. Like the thrushes, we have migrated down to lower elevations. Life moves at a faster pace in the valley where the other humans are. A part of me is horrified by this–I want to remain at a walking pace, travel as lightly as possible, and keep life simple. Town feels noisy and claustrophobic, and I find my thoughts running in different channels than they do in summer. If the thrushes can adapt, so can I. There’s no way of knowing if they miss the big trees like I do, and the steep glacial valleys. I watch them flying around the garden, and they appear to accept reality. Hm. There’s a lesson for me here. Make the transition gracefully. Watch out for predators (especially a gray cat named Henry). Hang out with friends. Find things to eat, and take shelter from storms. Go out when the weather is decent. The seasons are what they are, and nothing stays the same. The world is in motion, and that’s good. All I need is an adjusted attitude. Thank you, thrushes. Lovely! And very wise too. Thank you for the reminder of varied thrushes and their wonderfully nasal and beautiful songs with the notes spaced out so that it seems like they’ll echo forever. And for the metaphor of adapting. We all need to practice that one. Blessings! Susan, thank you for stopping by the blog. The thrushes have given me something to think about in a new way. Blessings back at you!